The UVF and UDA (with the exception of the the South East Antrim UDA, who chose not to participate) have formed a new umbrella group calling itself the Loyalist Communities Council (LCC). They vowed to ‘disown’ anyone who continue to use their name as a ‘cover’ for their crimes. However, there was no talk of disbandment or any other weakening of their paramilitary structure. The statement was issued at a press conference in an east Belfast hotel with several members and leaders of the main groups present to offer endorsement. The UDA and UVF said they will concentrate on “law abiding responses to criminality”, as well as addressing loyalist “disenfranchisement” from the political process. They also issued a demand for an end to historic prosecutions and sought direct participation in the Stormont talks process. 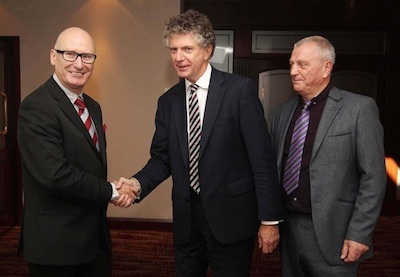 Jonathan Powell, the former chief of staff to Tony Blair, (pictured, centre) assisted the UDA and UVF in formulating and presenting their demands. He claimed the groups should continue to operate in a “civil fashion” and said they should receive more funding if they move away from sectarian violence and crime. An organisation called the ‘Tony Blair Faith Foundation’ was subsequently forced to deny it was a new source of grant aid, reportedly up to one million pounds. “We really don’t want to see a Real UVF and a Continuity UDA. It is far better the groups continue but there is no criminality; there is no violence; they continue in a civil fashion,” said Mr Powell. While heavily involved in organised crime, both the UDA and UVF have received millions in public money over the years in various forms, including salaries for bogus ‘community workers’ as well as grant aid for various ‘initiatives’. This week it emerged that even the flammable material used by the groups in their ‘Eleventh Night’ bonfires, synonymous with sectarian hatred and violence, is paid for by some council authorities. Victims campaigner Raymond McCord, whose son was murdered by the UVF, called the latest initiative “a sham”. “It’s about money, power, greed and control. Why not just disband? They won’t because they make too much money from it,” he said. He also raised concerns about the potential for an amnesty for his son’s killers. “Make no mistake about it, this is a road to amnesty and bigger cover-ups,” he added. East Derry SDLP assembly member John Dallat also described the initiative as being about money. He said the UDA in north Antrim and Derry “are responsible over the years for more than 20 murders”. The initiative, which excludes the breakaway south-east Antrim UDA faction at the outset, appears to have also been rejected by the UDA in north Antrim. “So people in our community want us to roll over and leave the stage. Are you rite (sic) in the head folks? Sinn Fein’s Gerry Kelly said that any genuine move by loyalists towards disbandment would be a positive step, but that he had some “reservations”. “The demand for an end to historic prosecutions must be rejected as it flies in the face of the Stormont House Agreement which was about enabling families the opportunity to have maximum disclosure of the truth and access to justice. He also warned that funding proposals should be aimed at tackling “deprivation and disadvantage” and “based on proven objective need”.